Systemic and local factors can influence the sequence and timing of eruption. , Early loss of primary teeth can effect the eruption of successors, but the exact effect appears to be variable depending on the stage of development and time of extraction. ,, In this paper, a very rare case of early eruption of permanent canines in a 7-year old female patient is discussed. A 7-year old female patient came to the Department of Pedodontics, with the chief complaint of decayed right lower teeth. She was moderately built and nourished and gave no history of any systemic disease. The history of previous extraction or exfoliation was inconclusive. The intraoral examination revealed grossly decayed 84 and 85. Deep dentinal caries were seen in 54, 64, 74, and 75 and further examination revealed their irreversible pulpal involvement. Tooth numbers 55 and 65 were decayed and were restorable [Figure 1], [Figure 2] and [Figure 3]. 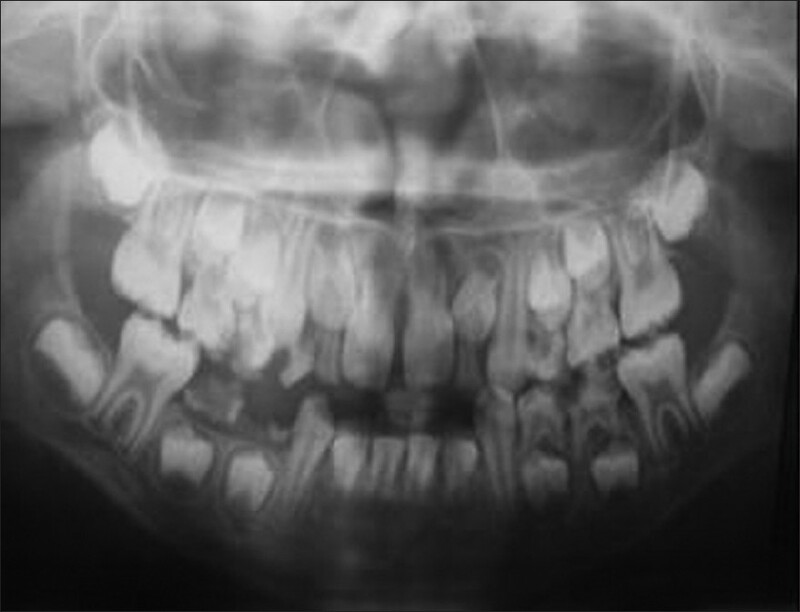 Crown of the erupting 23 was seen through mucosa [Figure 4] though the patient was only 7 years old. On further examination, all canines except upper right canine were showing the morphology of permanent teeth. A panoramic radiograph was advised to confirm the clinical diagnosis. Ortho pantomogram showed erupted 23, 33, 43, and erupting 13 [Figure 5]. Another important finding was that apex of the lower canines was closed suggesting complete maturation of those teeth and its eruption at least 2 years back. It also revealed incompletely formed roots of erupted lower incisors and upper central incisors in accordance with the chronological age. The patient was referred to a physician to rule out any systemic diseases like hyper thyroidism, which is usually found to be associated with early eruption of permanent teeth. No systemic disease was reported by the physician. Figure 3: Maxillary and mandibular casts showing erupted tooth numbers 23 and 33. Figure 4: Erupting 13 is seen through the mucosa. Local and systemic factors can influence the eruption time and sequence of eruption of teeth. , Generalized premature eruption of teeth can be seen in systemic diseases like hyperthyroidism, hypophosphatasia, acute lymphocytic leukemia, cyclic neutropenia, histiocytosis X, cherubism, acrodynia, and early onset periodontitis. It can also be seen in syndromes like Papillon-Lefevre syndrome, Sotos syndrome, and Proteus syndrome. ,,, In the case discussed, the early eruption seen was purely localized involving only permanent canines. Further most of these conditions show early premature loss of mobile teeth also since their periodontal attachment is weak unlike in present case. All these conditions were ruled out also by medical assessment by the physician concerned. According to Posen,  early eruption of permanent teeth could be due to premature loss of primary teeth if the loss occurs within 1 year before eruption. 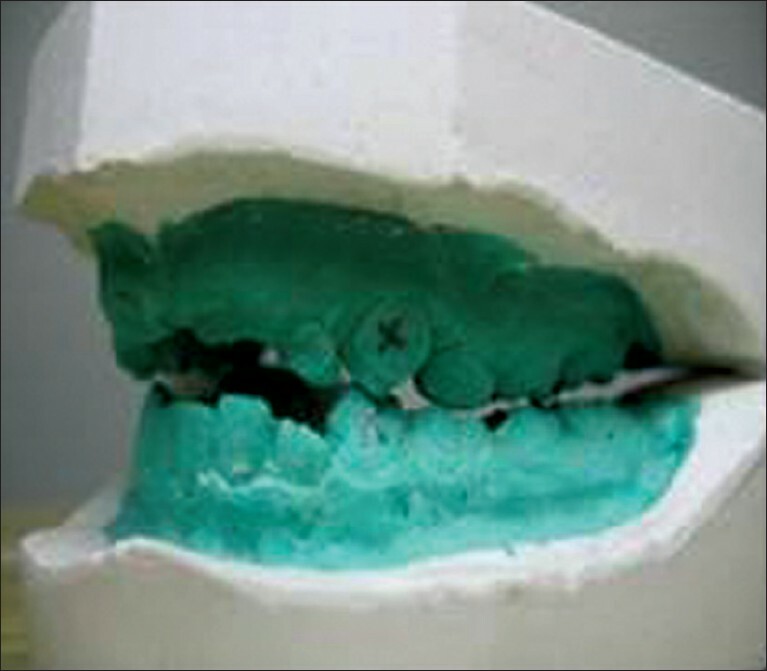 But if the extraction is done at a very young age, the eruption of teeth are delayed. , In the present case, no conclusive history regarding premature extraction or exfoliation could be elicited. But according to the above mentioned studies, , the eruption should have been delayed in present case even if there was premature loss of deciduous teeth. The normal eruption time of maxillary permanent canine is at 11-12 years and that of mandibular permanent canine is at 9-10 years and their root closure occurs at 13-14 years and 12-13 years, respectively. , In the present case, at age 7, the eruption of 23, 33, and 43 has already occurred and 13 is erupting. 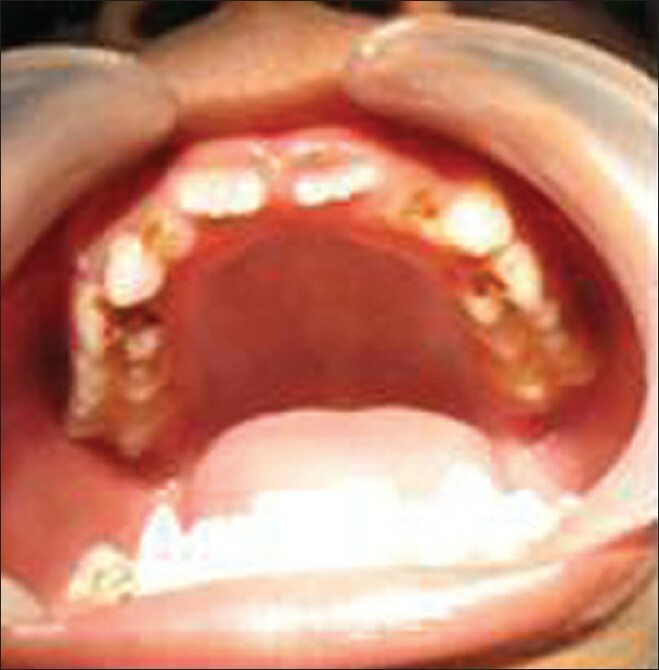 Eruption of a permanent mandibular canine in a 5 year old boy was reported by Turnbul and Lai. They reported that root completion of the erupted tooth was two-third formed suggesting recently erupted tooth. In the present case, surprisingly lower canines showed root closure where as upper canines were showing incomplete root formation. Hence, it can be assumed that the lower canines may have erupted at least 2 years before, that is at around 5 years, since root completion occurs approximately 2 years after eruption. No similar case could be found by the author in the literature, where eruption and root closure of permanent canines have occurred at such a young age. Another important finding was that erupted lower incisors and upper central incisors were showing incomplete root closure suggesting its normal development in accordance with the chronological age. 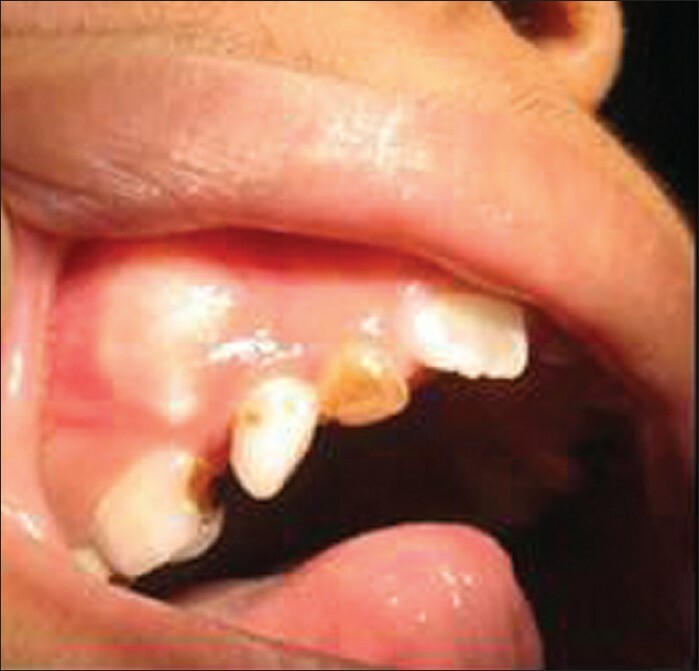 Camm and Shuler  noted very early eruption of premolar in 5-6 year olds following early loss of abscessed primary molars. In these cases, erupted premolars showed mobility, since the root was not properly formed. However, in the present case there was no such mobility since eruption has occurred after sufficient root development. As the erupted permanent canines were of normal morphology and in normal occlusion it was decided to periodically observe them with no active treatment. It was decided to extract the grossly decayed teeth and space management was planned. Teeth with irreversible pulpitis were to be endodontically treated and decayed teeth were to be restored. Though the eruption and shedding of teeth shows some physiological variability, there may be some clinical cases with some extreme variations. The pediatric dentist should keep an open eye and mind to identify such variations. The present case with early eruption and root completion of permanent canines represents such an extremely rare case. 1. Mc Donald RE, Avery DR, Dean JA. Dentistry for the Child and Adolescent. 8 th ed. Mosby2004. p. 176-82. 2. Turnbull NR, Lai NN. 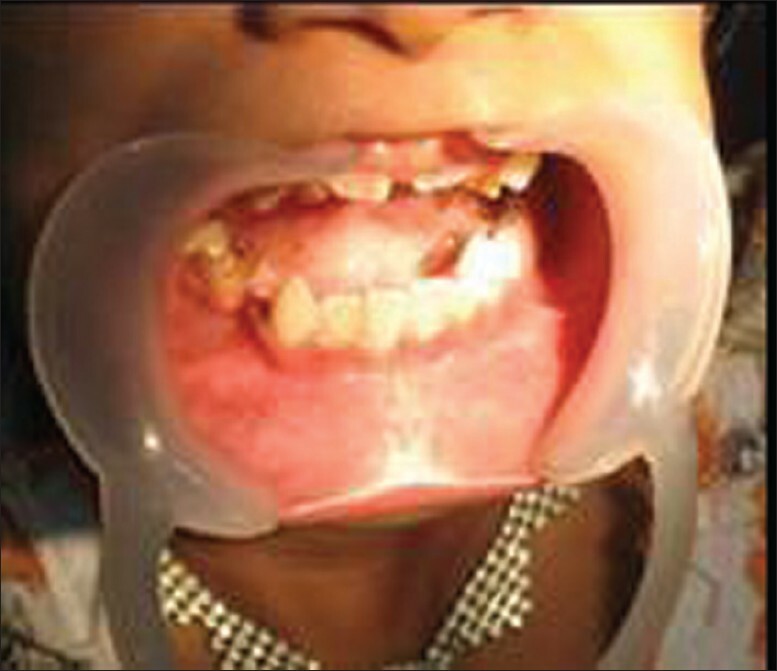 Eruption of a permanent mandibular canine in a 5 year-old boy. Int J Paediatr Dent 2003;13:117-20. 3. Posen AL. The effect of premature loss of deciduous molars on premolar eruption. Angle Orthod 1965;35:249-52. 4. Van der Linden FP. Result of premature loss of deciduous teeth. Development of dentition. Illinois: Quintessence Publishing Co Inc; 1983. p. 129-54. 5. Logan WH, Kronfeld R. Development of the human jaws and surrounding structures from birth to age 15. J Am Dent Assoc 1933;20:379. 6. Camm JH, Schuler JL. Premature eruption of the premolar. ASDC J Dent Child 1990;57:128-33.